You may have all of your baking wrapped up and are getting ready for holiday festivities, but if you’re in need of a last-minute Christmas dessert with ingredients that are most likely already hanging out in your pantry, this is a perfect one. I love the seasonal flavors of gingerbread – it’s warm and wonderfully spiced… a piece of this cake feels like a gigantic Christmas hug. The cream cheese icing on top doesn’t hurt, either! Bundt cakes are a favorite of mine – they come together easily and make for a beautiful presentation. Plus, they tend to turn out much moister than traditional cakes… win-win! What are you serving for Christmas dessert this year? 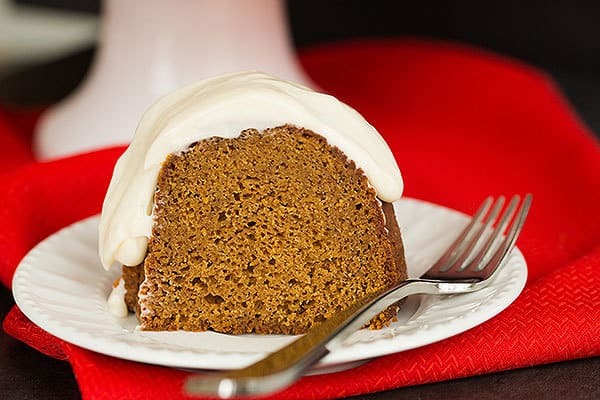 A warm, perfectly-spiced gingerbread cake smothered in a soft cream cheese icing. 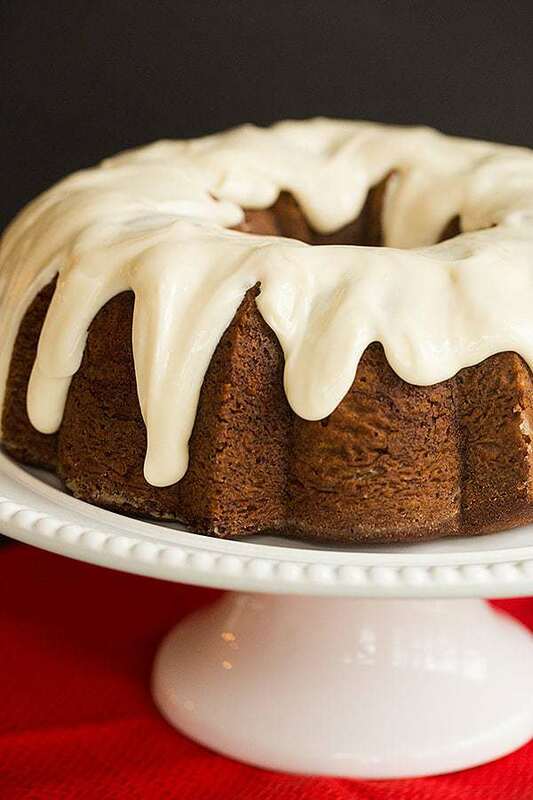 Make the Cake: Preheat oven to 350 degrees F. Grease and flour a 10-cup Bundt pan; set aside. In a medium bowl, sift together the flour, baking powder, salt, baking soda, ginger, cinnamon, allspice and nutmeg. In a small bowl, whisk together the molasses and the brewed coffee. Cream the butter in a large bowl with an electric mixer on medium speed until smooth and creamy. Add the brown sugar and beat until light and fluffy, about 3 minutes. Beat in the eggs and yolks, adding one at a time and scraping down the bowl intermittently. Reduce the mixer speed to low and add the flour and coffee mixture alternately, beginning and ending with the flour, mixing until smooth. Using a rubber spatula, give the batter a final stir to ensure all of the ingredients are thoroughly combined. Pour the batter into the prepared pan and smooth the top with a rubber spatula. Gently drop the pan onto the counter two times to remove any air pockets. Bake for 40 minutes, or until a toothpick inserted in the center comes out clean. Make the Cream Cheese Icing: Using an electric mixer, beat the cream cheese and butter on medium speed until smooth. Reduce the mixer speed to low and slowly beat in the powdered sugar until smooth. Beat in the vanilla extract, then slowly add the milk, 1 tablespoon at a time, beating after each addition. Pour the cream cheese icing evenly over the top of the cooled cake and allow to set at room temperature, about 30 minutes. Leftover can should be placed in an airtight container and kept at room temperature for up to 4 days. I made this for Xmas dinner as I was dessert responsible. It was FABULOUS and DELISH! It will be my forever Xmas cake, thank you. Yum. I have a photo but not on instagram. Made this cake a day beofe it was to be served, making the icing the day of. Sadly.. the cake was extremely dry! I usually don’t have this issue when making a cake prior to the day it’ll be served.. disappointed! Made this on the weekend and it was a HUGE hit! We love it so much. The perfect “tea” cake but for Christmas. 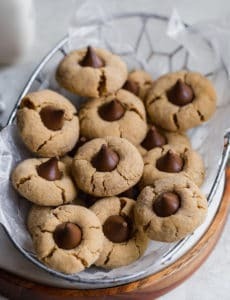 Well, actually, this will be added to my frequent baking list, notnjust for Christmas. So easy to eat half the cake in one sitting! Has anyone actually MADE this bundt cake? I measured meticulously, greased and floured my bundt Ian, set oven to proper temp and took out at 40 minutes to check. My cake fell in completely. It looks like a total mess! Either there is too much butter in this a recipe or not enough flour? I didn’t have the beer, so I used strong coffee to substitute for that malty/bitter taste. Also used orange juice instead of milk for the glaze, no vanilla, and added some finely grated orange peel. AHHHH MAZING! Delicious cake! It was a big hit with everyone except my 9yo, who doesn’t like the coffee taste. Suggestions for an alternative? Water? Hi Alice, I think regular hot water would probably work. 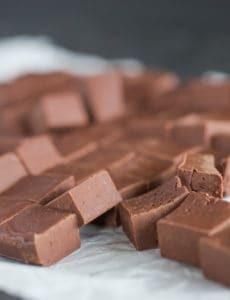 Making a chocolate cake for today, but this looks yummy! 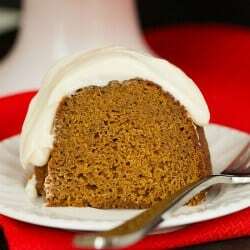 Love all things gingerbread…nothing like a whole bundt cake full of it’s spicy goodness, this looks delicious! This recipe sounds so amazing. 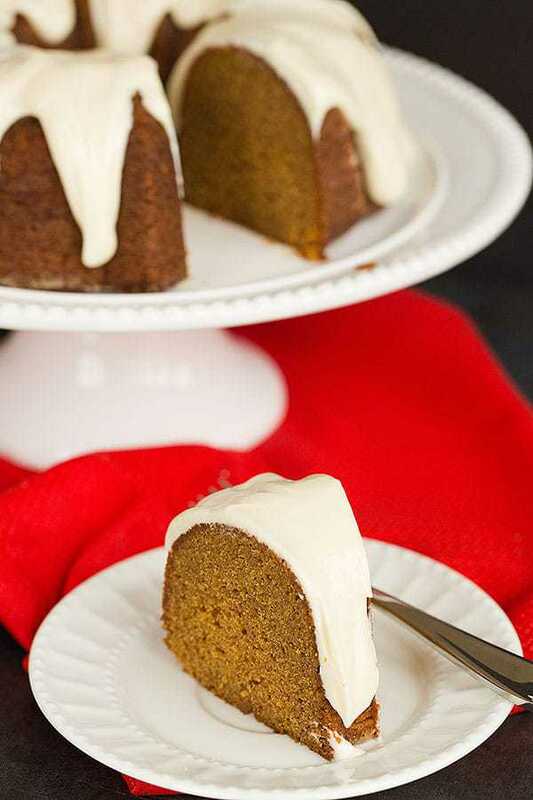 You can’t go wrong with anything gingerbread! This looks delicious! I think I’ll be making this sometime between now and New Year’s. I have a beautiful Christmas bundt pan from W-S that should be perfect for this (although all that luscious cream cheese icing will probably cover the design of it). May have to put the icing on as it’s being served ;) Have a Merry Christmas, Michelle! Beautiful cake Michelle! I love Bundt cakes and pans. For Christmas dessert I am making a Fresh Cranberry Nut cake in my Christmas Tree Bundt pan along with a Chocolate Tart. Will pin your recipe for next year. Merry Christmas!! I haven’t made anything gingerbread all year!! Such a shame. A cake sounds like a great idea! Oh I love this…I plan on baking a good part of today and tomorrow! Part of the Christmas fun right? Merry Christmas! This looks amazing. Definitely making this for my sister – she loves gingerbread! 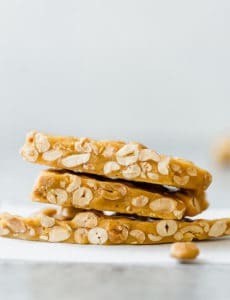 Thanks for this recipe and for the DIY gifts, I’m using every one for my family! That’s a lovely cake. I love gingerbread and this cake is really up my alley.